In 2006 Heather & Neil Barrett purchased the building to provide a home for the then newly formed Mount Alexander Sustainability Group. The aim was to refurbish the building whilst maintaining as much as possible of the original building. Whilst respecting its heritage, some contemporary architectural changes have been made to make the building more climatically comfortable and to meet current safety standards. A full energy audit was conducted and many sustainability features were incorporated into the rebuilding. some of the newly constructed elements of the building have been made with timber recycled from within the building. For example, the restaurant reception counter has been made from the old bar which came from a bank in Talbot in the 1980s. a shower provided for those who cycle or run to work. 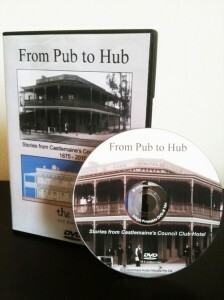 Purchase the DVD: ‘From Pub to Hub – Stories from Castlemaine’s Council Club Hotel 1875-2010’. The DVD contains a wonderful selection of stories told by the children of former licensees and pub clients. A bonus is film of the opening of the Hub by Barry Jones in April 2010.